Sky Zone Tampa will be hosting the characters of your kid’s favorite TV shows at Toddler Time. Members of Paw Patrol as well as Pj Masks, Elmo and many more will be at Sky Zone Tampa for several special meet & greets throughout this month and next. This event is just for toddlers, no children over the age of 7 participate so it is safe and fun for toddlers without the worry of big kids. 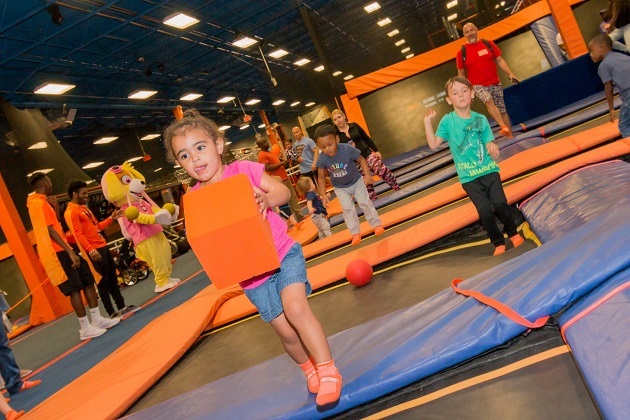 Tampa’s Sky Zone has free-jump trampolines so your little ones can safely jump on trampoline squares on the floor and even the walls! Sky Zone also has a dodgeball trampoline court, basketball hoops and a rope ladder above a pit of foam. Toddler Time at Sky Zone is a great opportunity for toddlers to bond with their peers and parents, without their parents having to worry about older kids. It is a super fun experience for toddlers, while parents can supervise and play along, too. Each toddler is $12.99 and one parent gets in for free with that price so it's reasonable for all budgets. The slip-resistant socks, however, to do come at a separate charge. To ensure your little one's safety, Sky Zone requires a liability waiver be filled out prior to participation, but you can save time by filling it out online so your child can meet all the beloved TV show characters and get to playing! If your child wants to meet Paw Patrol, Elmo, Shimmer and Shine and more, then get your tickets for a morning of fun. You and your toddler won't want to miss out! To stay up to date on family friendly activities in Tampa, connect with 813area today, it's free!